Be the first to share your favorite memory, photo or story of Angela. This memorial page is dedicated for family, friends and future generations to celebrate the life of their loved one. 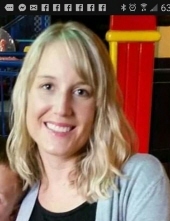 Angela L. Huhn 38, Wausau passed away on January 31, 2019 after a long battle with drug addictions. She was born to Louis and Lynn (Goebel) Huhn on May 16, 1980 in Fond du Lac, WI. She had a huge heart, a contagious smile and would lend a hand to anyone in need. Angela also enjoyed cooking, gardening, traveling, but most of all she loved spending time with her son Landon. She is survived by her son Landon, parents Lynn Miller, Louis (Michelle) Huhn, sister, Amanda (Andrew) Liebe, nephew Mason, grandmother Linda Baierl, aunts and uncles, Larry (Judy) Goebel, Lyle (Jody) Goebel, Marsha (Jeff) Blank, Brian (Brenda) Baierl, Lois (Bob), Koehler, Lynn (Bob) Klinke, Les (Sue) Huhn and Lance (Becky) Huhn, along with many cousins and friends. She is preceded in death by her grandparents, Frank Baierl, Lawrence Goebel, Louis (Rosalin Olig) Huhn and cousin Chris Koehler. Services will be held on Tuesday, February 5, 2019 at Mt. Olive Lutheran Church 6205 Alderson St, Weston. Visitation will be from 10:30 to time of service at 12:00 with Pastor Lance Hoelscher officiating. In lieu of flowers donations may be forward to the Marathon County A.O.D. Partnership two help others who are struggling with addictions. To send flowers or a remembrance gift to the family of Angela Lynn Huhn, please visit our Tribute Store. "Email Address" would like to share the life celebration of Angela Lynn Huhn. Click on the "link" to go to share a favorite memory or leave a condolence message for the family.